Last Thursday Blu-ray Disc Association chairman Frank Simonis said that Blu-ray discs were now out-selling HD DVDs by 3:1 in the US - a claim Van Wynendaele disputes. Van Wynendaele argues that the reason for the disparity is that new owners of PlayStation 3 games console are simply redeeming free Blu-ray movie vouchers given to them by Sony that they have to exchange at retail stores - this is distorting genuine sales figures, according to Van Wynendaele. He counter-claimed by declaring that Toshiba had sold 200,00 HD DVD players in the US, compared to just 30,000 true Blu-ray players. Van Wynendaele said that the two million PS3 sales could not be counted because there was no guarantee that people who were buying the consoles were: a) choosing to buy movies with their own money; or b) actually watching Blu-ray movies at all - the vast majority could be using the PS3 to play games on, for example. The truth is, he said, that neither format could claim victory when high def player sales accounted for less than 1% of regular DVD player sales - in the US at least. Van Wynendaele also said that Toshiba's player pricing strategy would still put its HD DVD format at an advantage when compared to Blu-ray. He said Sony's decision to offer a lower-priced player later in the year would be undercut by Toshiba. He also said the company's own research had confirmed that even at £450, many people still believe HD format players to be too expensive when compared to the bargain basement prices offered by supermarkets on DVD players. 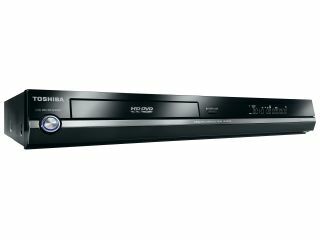 Toshiba launched a £449 1080p HD DVD player - the HD-EP10 - last week. Blu-ray players currently sell for around £1,000. In Part Two , Van Wynendaele talks up HD DVD in Europe, dismisses Blu-ray's 'bigger capacity' claim and confirms launch of SED TVs from Toshiba.